How did this young boy growing up in Kalispell, Montana make such an impact on the world that celebrities like Bono sought out his friendship and counsel? On 22 October 2018, the famous and beloved American Christian writer and Pastor, Eugene Peterson, passed away at the age of 85 from complications related to heart-failure. He is best known for his contemporary and catchy translation of the Bible – The Message. His family released a statement that it was fitting that he died on a Monday, the day he always honoured as his Sabbath during his years as a pastor. Peterson’s father was a butcher and grocer and his mother was an Assemblies of God pastor. As a young boy he was often bullied by his friends and spent many hours by himself reading or spending time in nature. Even though he became famous in later life through the popularity of his written works (he has published over 35 books), for most of his life he was a small-town pastor, rooted in one place and committed to serving in the congregation at Christ our King Presbyterian Church in Bel Air. How did this young boy growing up in Kalispell, Montana make such an impact on the world that celebrities like Bono sought out his friendship and counsel? I would like to reflect on three things that stand out to me about Eugene Peterson’s life and ministry. The first thing I want to reflect on is what went on in Peterson’s life when nobody was looking. Of course, we don’t really know what he did when he was alone at his home, but there are things we do know from what friends and people who knew him have shared. When he was a student at Seattle Pacific College, we know that he gave himself diligently to studying the Greek and Hebrew languages. Years later, when he began working on his own translation of the Bible, all those years of hard intellectual labour paid off. The depth, the creativity and the power of his written words were the result of many years of steadfast and unyielding commitment to study and prayer behind closed-doors. This is a key lesson for those of us in Christian leadership. Even in Christian ministry there is real temptation to sell cheap, useless ‘goods’ using flashy Christian packaging—to ‘fleece the flock’ to further one’s own agenda. We’re all too familiar with overworked pastors who end up preaching on Sunday morning without actually putting time and effort into preparing their sermons, or Christian musicians who get caught up in worldly marketing strategies to increase CD sales. These temptations are real. But we learn from Peterson’s life that if we’re going to make a positive and significant contribution to our world, then there are no short-cuts to achieving this. No matter in what field or sphere of society, if our lives are going to make an impact and bear good fruit, it will require this kind of ‘closed-door faithfulness’ and long-term perseverance. As a pastor he was alert to the constant danger of clichés and religious cants destroying our language. He knew Christians could easily mouth pious platitudes to hide what is really going on inside their soul. He saw the problem of Christians in America objectifying the Bible, reading it literalistically and defending it vehemently, but impotent to live by its statutes or know God’s power in their lives. Therefore he admonished us that “poets are essential allies in purifying our language,” and to read the Bible poetically, allowing it to awaken the imagination and reshape reality according to God’s vision for the world. Peterson was as much a prophetic poet as he was a pastoral writer. 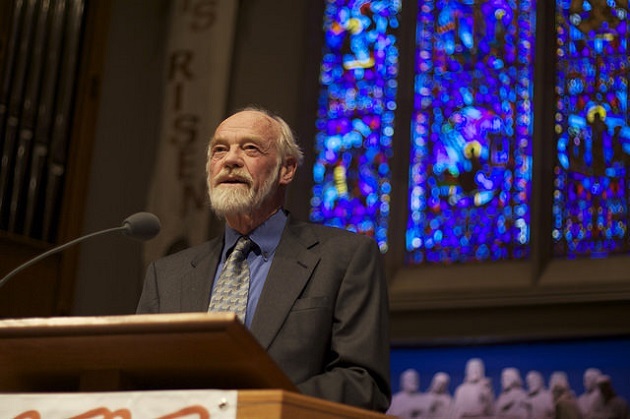 The final thing that stands out to me about Eugene Peterson was his calling and ministry as a pastor. Many pastors who knew him have reflected that Eugene Peterson restored honour back to the vocation of a pastor. Peterson himself grew up in a Pentecostal church that emphasized extraordinary and ecstatic experiences, and the shallow anti-intellectualism and manipulation of people that went along with this. Early on in life he decided that this was not for him. Instead he decided to pursue the life of the mind. He wanted to become an academic, however he gave up his doctoral studies to become a pastor. His vision for being a pastor was very different to what he had seen before. He stayed away from mega-church Christianity and tele-evangelists, who conducted their ministries as if they were lucrative business opportunities. He condemned this kind of ‘Christian’ culture as materialistic and full of lies—any kind of consumeristic spirituality that shunned self-sacrifice and costly commitment was not really Christian. Instead, for Peterson, pastoral ministry was about walking alongside ordinary folks who wanted to follow Jesus. In his words, a pastor must be willing to “show up and shut up”. Being a pastor is not about offering quick-fix solutions or even good advice. He knew that it was about offering people the gift of listening. His pastoral ministry animated ‘cruciform witness’, a shepherd willing to lay down his life for his flock. This was life-changing ministry. Eugene Peterson, thank you for being a humble and faithful servant of Christ. And, thank you for giving us The Message. Your earthly fruit will continue on for many years to come. Philip S. Powell manages the Learning Community of the Jubilee Centre. This article first appeared on the Jubilee Centre website and was republished with permission.